Tools USA sells Rotisserie For Car and Truck Frames. Let’s face it; we are not getting any younger and our bodies tend to ache more than usual. People who work on cars have sore backs, well, all the time. Sure, there are dollies or carts that will slide you in and out… but you’re still on your back. Wouldn’t it be easier if the car’s under-body came to you? TA-DA! Meet the auto rotisserie. It’s called a rotisserie because it spins the frame of the car around 360 degrees, just like a rotisserie chicken! It’s a great value for an unbeatable price. For less than $1000, this is a must have for anyone restoring the body or frame of a truck or car. 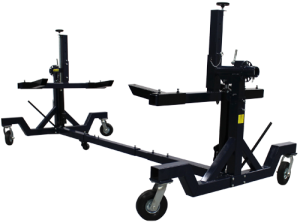 Frame restoration is made easy with this quality car rotator. Once the vehicle is lifted onto the rotisserie, it can be spun around a full 360 degrees for full access. It puts the person working on the vehicle in a comfortable upright or sit-down position to have full access for sanding, welding, and any other body work needed. It is also much safer than working underneath a car that is on sitting on jack stands. Click here for more detailed information on the rotisserie we sell.